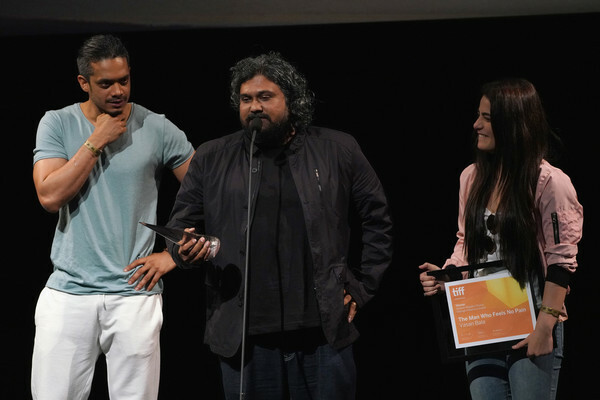 Vasan Bala was elated at TIFF’s closing Sunday morning awards gathering. He accepted the award and, referring to the trophy’s peculiar triangular shape, said that he felt like a ‘unicorn’! ‘The Man Who Feels No Pain’ received a glowing write-up in Variety, where critic Joe Leydon said, “Writer-director Vasan Bala’s wild and wacky yet also warm and fuzzy fable about a resourceful young man who transcends ostensible physical limitations to become a two-fisted, swift-kicking hero likely will prove to be an irresistible crowd-pleaser on the global fest circuit, and in international release on various platforms”. Words that would warm and delight the heart of any filmmaker. The People’s Choice Midnight Madness Award is not endowed with cash but the honour is a coveted one. Sandhya Suri’s ‘The Field’ won the Short Cuts Award for Best Short Film. The Jury commented on the film as follows: “The film is striking for its aesthetic lyricism, tender performances, and powerful emotional impact. It's a unique and refreshing glimpse into female desire set in rural India that demonstrated a scope greater than its short format.” The award is endowed with a $10,000 cash prize, made possible by IWC Schaffhausen. ‘The Field’ follows a poor agricultural labourer, Lalla, as she leads a double life in the village's last remaining cornfield. But with the approaching harvest, she feels her deceptive ways may be exposed. The film presents a refreshingly layered portrait of a woman who bravely pursues a different kind of life than the one she has been granted.